Firebug v1.10.0 just released few days ago, here are some new features related to CSS. 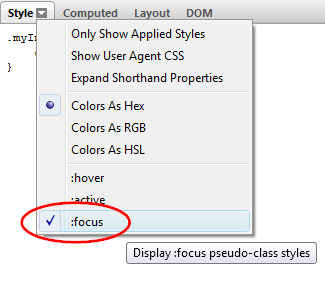 Previous versions of Firebug only supports :hover and :active states, now with v1.10 you can find the new :focus state in the Style menu. Now the computed styles pane also displays the file and line of every attribute. @import statements which use media queries can now be edited directly within the CSS tab. For more info about Firebug v1.10, check sitepoint‘s blog post. Just in case you don’t know, LIVEditor is a new text editor for editing html/css lively with a Firebug-like UI for inspecting, testing and editing css styles. Posted in Firebug and tagged edit css lively, Firebug, Firebug 1.10, Firebug 1.10.0, testing css.